Buckminster Fuller's Dymaxion world map, which can be folded to make a regular 20-sided icosahedron (one of the five "Platonic solids"). If you're over 50, chances are the obligatory world maps hanging in your classrooms were based on the Mercator projection. You probably remember it: Greenland, which is 14 times smaller than Africa, appears to be the same size as the continent. And Europe looks twice as large as South America, instead of half the size, as it really is. Dutchman Gerard Mercator, as smart a businessman as he was a mapmaker, would have been appalled if he knew his map projection was used to educate children in geography, since it was never intended as anything like an accurate depiction of the globe. 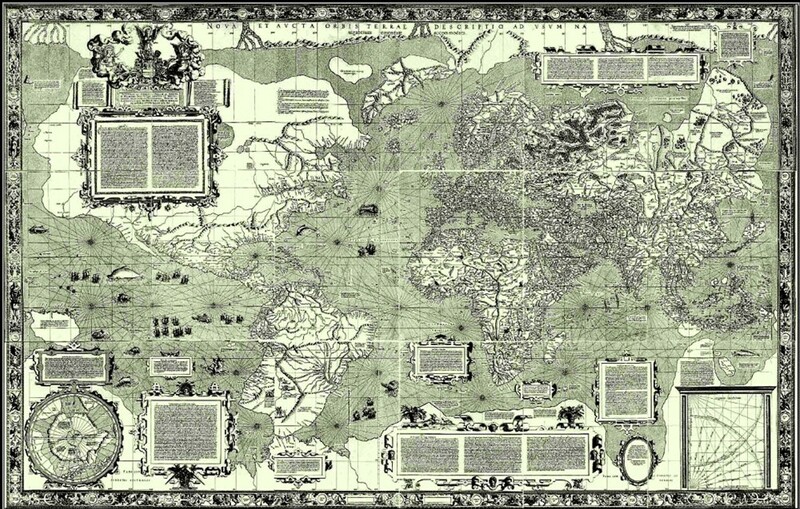 The English title of his 1569 map (the first world map to use what we now call the Mercator projection) is "A New and Enlarged Description of the Earth with Corrections for Use in Navigation." Navigation! The Mercator projection was designed to guide seafarers, particularly those venturing from Europe to the New World. Ships' pilots could simply follow a straight line (technically, a rhumb line) on his map to sail most efficiently from A to B. Mercator, who produced (or copied) many other maps, knew full well its inadequacy when it came to depicting an accurate picture of the Earth. But then, no map can do this. The surface of a round Earth doesn't translate perfectly onto a flat piece of paper, no matter which way you cut, bend or stretch it. Peel an orange, and you can see the two basic solutions to the dilemma. One is to flatten the peel, tearing it as you go; the other is to imagine the peel as an elastic sheet, and keep it intact by stretching it. The most successful example of the "tearing" method is, in my opinion, Buckminster Fuller's 1943 Dymaxion map. By approximating the Earth's spherical shape as a regular 20-sided icosahedron, and by making intelligent decisions about which edges to cut and which to fold, Fuller was able to show the continents as nearly contiguous. Such a projection is useful in illustrating, for instance, the progress of human migrations out of Africa. By basing the map on an icosahedron, he was also able to keep area distortion to less than 2 percent. On the other hand, the "elastic peel" method of flattening the sphere has been the traditional method of mapmakers throughout history, at least since the Greco-Egyptian geographer Claudius Ptolemy (90-168 AD) created his representation of the known world. My vote for the best of this kind goes to the 2003 Hobo-Dyer cylindrical equal-area projection. This particular projection has zero distortion ("standard parallels") at 37.5 degrees latitude north and south, with lands closer to the equator shown narrower than they actually are, and with polar regions stretched sideways. It's about as good a compromise as you can achieve on a rectangular sheet of paper, although it's hopelessly incorrect as you approach the poles. Back to Mercator. The projection used on his 1569 map is out of fashion these days — if you're younger than 50, the world map you grew up with as a kid was probably similar to either the Dymaxion or the Hobo-Dyer versions, maybe both. And even navigators, in this age of satellites and GPS, rarely use Mercator's projection. Still, his invention of "what may be the most influential map in the history of geography," as Jerry Brotton writes in a new and fascinating book called A History of the World in Twelve Maps, deserves respect. 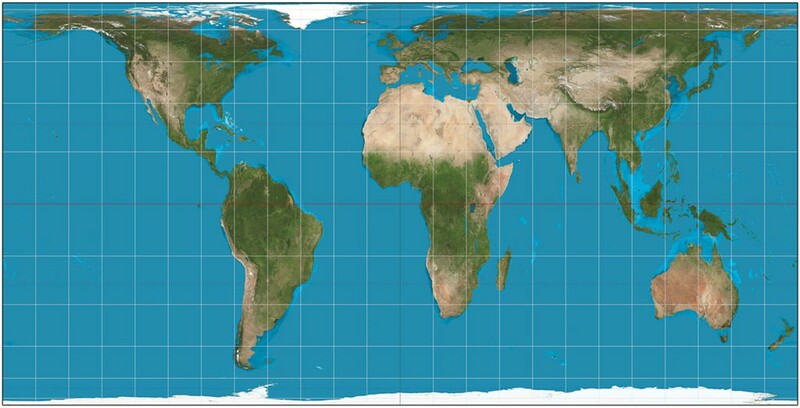 With its Eurocentric bias, the Mercator projection is politically incorrect and it distorts areas something terrible. But it did ensure that navigators could end up where they were aiming for! Barry Evans (barryevans9@yahoo.com) grew up with British Ordnance Survey inch-to-the-mile maps, the most beautiful maps in the world. They use the Mercator projection.